JTV was nice enough to offer me a piece from their holiday collection, and provide me with an extra one for you! Perfect timing for the holidays, and it's a gift you don't have to pay for! It's not a cheap gift either, so you can feel good about that. 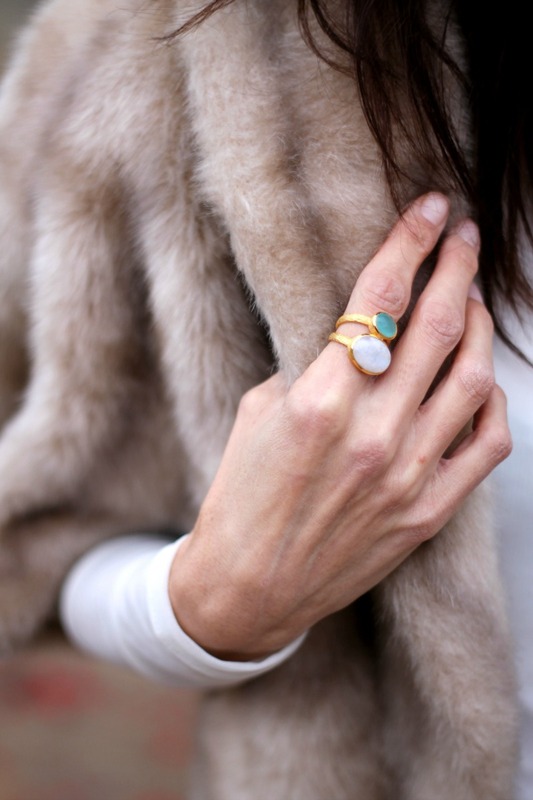 This ring is moonstone, aqua colored onyx and 18 ct gold! It retails for $69.99. I personally love it mixed with more clean, modern pieces. If you are interested, leave a comment below and I will pick the winner next Wed. This entry was posted on Tuesday, December 2, 2014. You can follow any responses to this entry through the RSS 2.0. You can leave a response. I LOVE this look! Perfection. Great jacket with these jeans! Love this ring! And moonstone is my favorite. :-) Love your mix of sleek modern and vintage style! I always love seeing your original and fresh style ideas--so inspirational! That's a nice ring too. Great pairing. 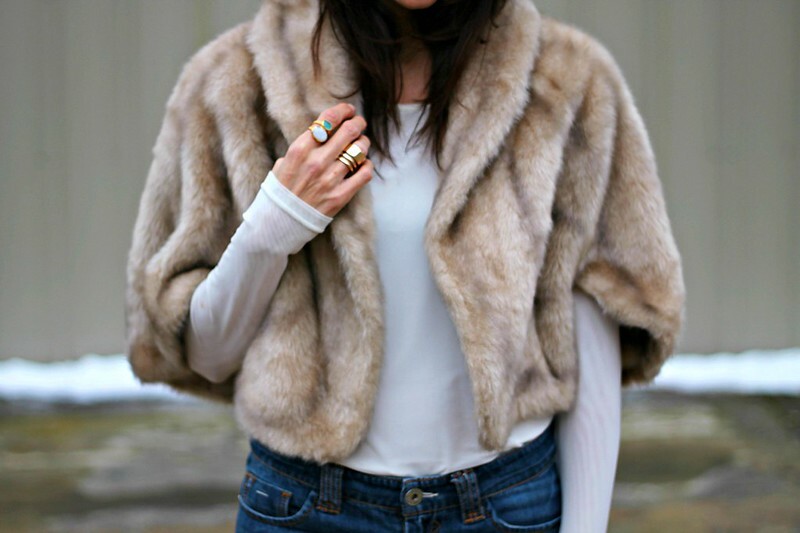 Cool look in faux fur!!! i can always use new pieces to add to my modest collection! The ring is gorge! But that capelet. Oh my Sheree, I know I live in FL but I may have to persuade you to part with that one, too. LOL! Love the rings as well, of course! ^_^ Always loving your style from top to bottom! WOw I want it its so lovely! Would love that ring! The capelet is a spectacular piece! I love the ring & the outfit! So me! That cape - so luxe....love it paired with the distressed denim & loafers. I love these jeans. They look great with the patent loafers! The ring looks lovely as well. I don't like to draw attention to my stubby little old lady paws, so I wouldn't have any trouble wrapping it up for one of my more elegantly fingered friends! What a cool piece! I'm definitely interested. Thanks. Love these! I'm a huge fan of gold jewelry. Fantastic ring and styling. Great juxtaposition of clean, sophisticated, and casual. Love the cool moodiness of moonstone, the warmth of yellow gold, and the depth of color in the aqua onyx. LOVE this ring! Thanks for the chance! That ring is beautiful and I love it with this outfit. You do such an amazing job of mixing modern with vintage! I'd love a chance to win the ring; my email is fashionforgiant (at) gmail (dot) com.